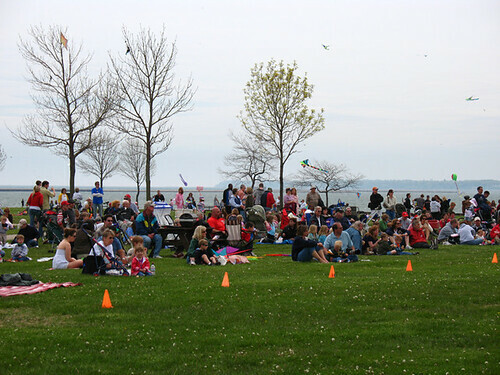 Well, here we go again, the Tour de Kites 2008 continues with the TWC Family Kite Festival on May 24th and 25th. Itâ€™s been a long cold snowy winter and we all deserve some fun. Over the winter, we have been talking about concentrating more on team flying and a little bit less on individual routines. Itâ€™s gotten to the point that so many individuals have formed all of these great teams, that we thought it would be more fun to show them off this year. So we will give more time to the teams in our schedule, which should really spice things up. If you recall, we sort of did that at Mots and kept the pace just rolling along. So with the teams, we will go at a fast clip, just like we did at Mots. It should be very exciting. Iâ€™m guessing that Ann will make sure that happens. Our title sponsor, Time Warner Cable is back again this yearâ€¦hurray! Many of our other sponsors are back and we have picked up a few new ones. Radio Disney has come on board and will manage the Kids Mad dash and candy drop on Saturday only. That will be exciting, as we bring the Disney brand to Veterans Park. Lindt Chocolates will be back and I know you all loved them. That candy was soooooo good. We will hold our 9:00 am pilot meeting at around 10:00am on Saturday, so plan on attending. If anyone has any other great ideas for this yearâ€™s events, please let me or Ann know in advance. John and Elaine from Puerto Rico are back and we canâ€™t wait for their new Salsa routines. We have a surprise guest flyer coming, but I have been sworn to absolute secrecy. Youâ€™ve seen him on TV, youâ€™ve seen him in print, and you have seen him a few times in person. Iâ€™ll leave it at that. I-Quad, which was a huge hit in September and they will be back at Mots. Our media sponsors are Time Warner Cable, B93.3, WLUM 102/1, 1290 am WMCS, and Radio Disney. I will have hotel information next week. Scott also said he will buy lunch for any IKE members that show up. Wear your Red shirt, tell him you're from IKE, and you get a lunch ticket. I wont be there this year, but it's close to Mots in style and a great time. I recommend it. With the long weekend I'm heading back to Grand Haven. Sorry Jeff but with the last month and a half worth of fest, that honey do list needs a little catching up. Will be out in pontiac on sunday though, which will be a start of another 3 week run. Oh well, looks like it's just me. Any other IKE lurkers that may be coming out, don't hesitate to come say hi. I'll be the only one in a red shirt. Maybe I'll help Brett teach the newbies about quads. Here's a notice of the festival from WTMJ in Milwaukee including a short video of Scott on one of their news shows. Awesome day out there yesterday, had a great time! Even got to do a little 4 person quad performance with Zach, Alison Newman and Eric Wolff. Another great weekend in the books. Had a terrific time. Thanks so much to Ann, the Fire, Brett, and all the rest of the performers and Scott for your hospitality towards me the whole weekend, and Susan and Kayla on Sunday. You're all awesome! The Chicago Fire was "on fire" yesterday. That routine to the Chorus Line song was the best I've seen yet, and you could tell the crowd knew it was special too. It was a great reaction. I did see a couple IKE shirts among the crowd...got to meet IKE member Loren and his son on Sunday. Love the delta with the arrow on it. Now I can't wait to get out again in Pontiac. Good thing it's a short week! Jeff, Tim and I had a good time out in the bug field. It was nice to meet you and your wife (picking your pockets). I enjoy the grand launch with this being the first time Tim and I lifted two separate kites. pretty fun. Oh, man, I hate to tell you... you should have stuck around. Wind picked up again, actually had to go to vented for while too! Glad you guys had a good time. Scott treats the IKE folks well and puts on a great festival. Hey, I see an IKE'r in the middle of this pic. Howdy, Loren.